A few weeks ago I was feeling optimistic about the flag process. The final 40 had included some excellent options. Surely, it would be an easy task to select just four decent designs from that pool. (Or so went my naive thoughts). But yet, the outcome of the grand reveal was a disaster. And it was enough to send a designer scrambling to replace his skinny chinos with sack cloth and ashes. Thus it was to my amazement that earlier this week, Red Peak finally made the ballot. It began with a ground swell of support from the creative community. Then leaped sideways into the mainstream. It seemed that for the first time we’d generated some genuine public discourse; New Zealand had finally woken up. Now that we’re on the ballot, the journey can begin in earnest. 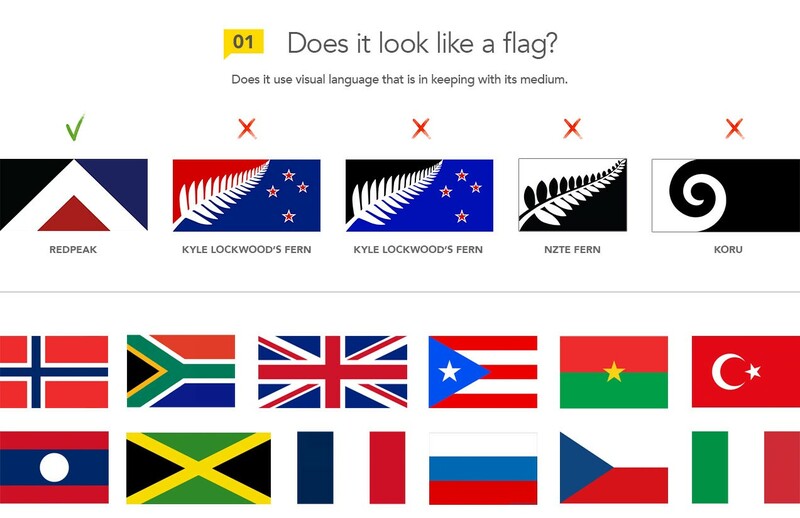 As a design professional, allow me to be your flag guide. Let’s break down the choices on hand and see how they perform. 01 Does it look like a flag? This is the vexingly vexillological standard that a nation’s flag must adhere too. Bullet number one on the non-existent design brief, that should have been handed to a design professional, would have said, ‘make it flaggy as f**k’. I’m paraphrasing of course. But you get the picture. Using the language of the medium is an obvious need. You don’t design a website on a typewriter. Even though they both have keys and can write lines of code. Likewise, you’re not being clever or thinking outside the box when you use the wrong visual language for a task. Clever is solving the problem using the medium at hand. And for flags, it is simple geometric shapes, and careful attention to lines of symmetry. 2 Does it play nicely with others? We designers often talk about a design ‘having legs’. It’s a commentary on how well it will integrate with other design as the body of work around it grows. I have a rule that the first decisions are the most important. Get them right early, and every successive decision becomes easier and easier. The inverse is also true. It’s a mistake to think of a flag in isolation, just flapping away up a pole. Flags end up in a variety of situations, surrounded by masses of different content. In each of these situations it needs to hold its own, but also support the adjacent content. 3 Does it work at scale? From flags, to badges, to icons on screens and projectors. Stickers on boats, bikes, and Bruce Maclaren Jr’s helmet. In this environment, scaling and ease of production matter. Arguably, you will view flags in a scaled environment more than anywhere else. In fact you probably last saw a tiny New Zealand flag a few hours ago when checking the rugby score. 4 Does it use pure design? There’s only one flag in our selection that uses the principles of design to achieve balance and harmony. 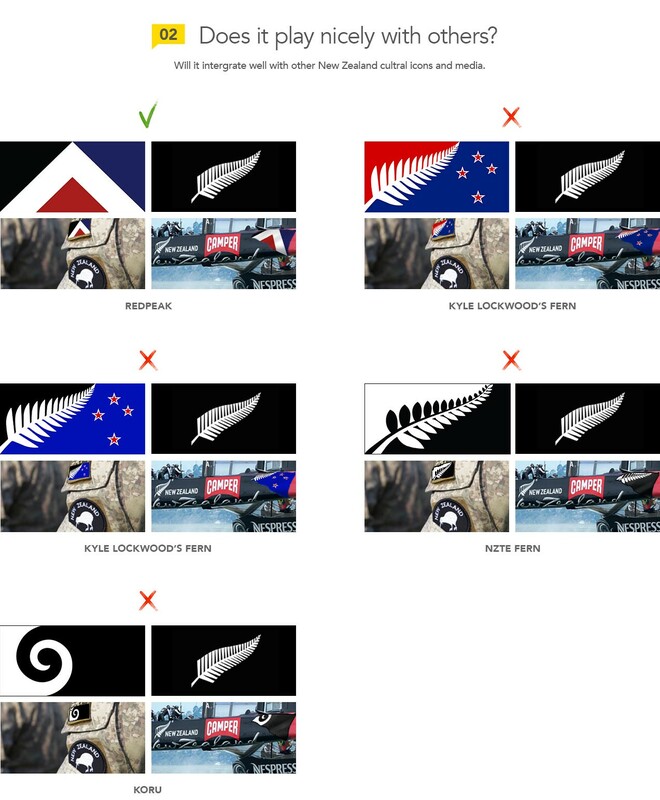 The others use visual language more at home on a logo — Potentially, a logo for cheaply made ‘New Zealand’ goods. As a design professional, they appear crass and poorly thought out. It’s a children’s picture book approach, (oh look a fern! ), when we should have moved on to adult fiction and metaphors. 5 Does it create stories? I wrote previously about how we must first create the object, before we can tell the story. 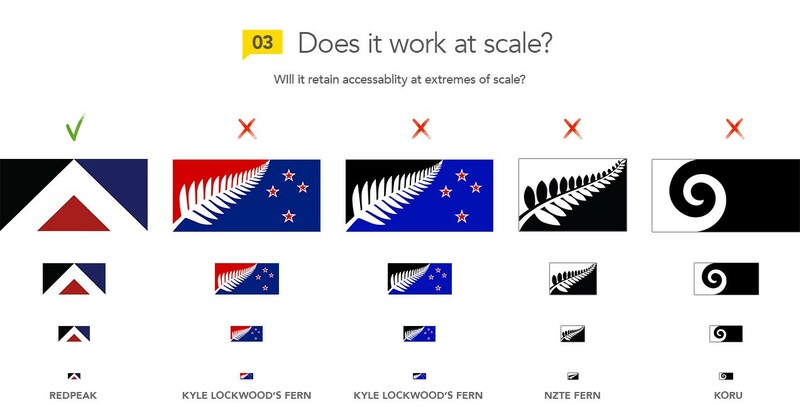 In this way, I’ve observed Red Peak slowly coming to life. All manner of art and personal creations have sprung into being. The design has left room for interpretation, which in turn has allowed individuals to create their own narrative. People want to be involved. They want to share their vision. They want to tell their story. 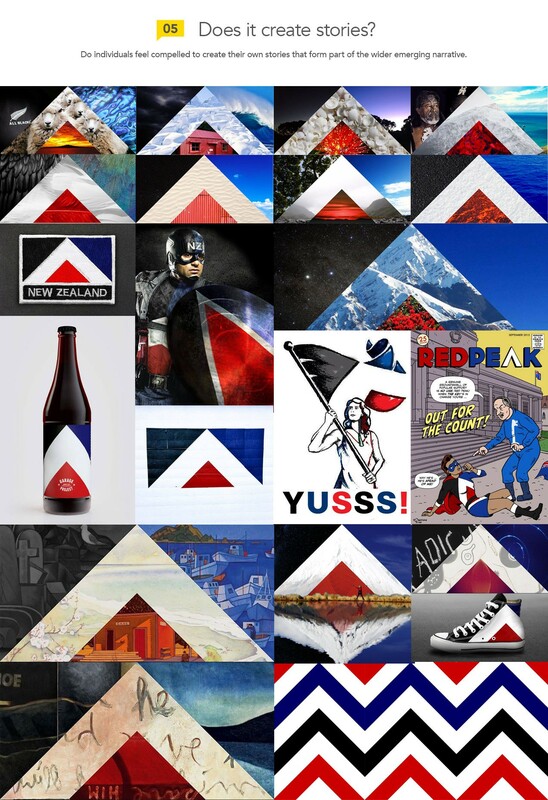 Seeing individuals find their own story in Red Peak, is its most compelling argument for acceptance. We’re beginning to find our voice and discover our story. Let this visual designer nudge you in the right direction. Give it a chance and you’re bound to find your story in Red Peak too.